There may be no better way to start a collection of Russian Art than to follow our monthly no reserve no minimum auctions. Every month we select a great painting and let you, our friends, go for it Sometimes the painting goes above the estimated price but often times it goes far below. This is a fun way to keep up with what is new at the gallery, add a little excitement to your life, and at the same time add to your Russian art collection! Congratulations to M. Martinez who placed the the winning bid for March's auction and added a treasure of impressionistic painting to her collection and for a great price too. 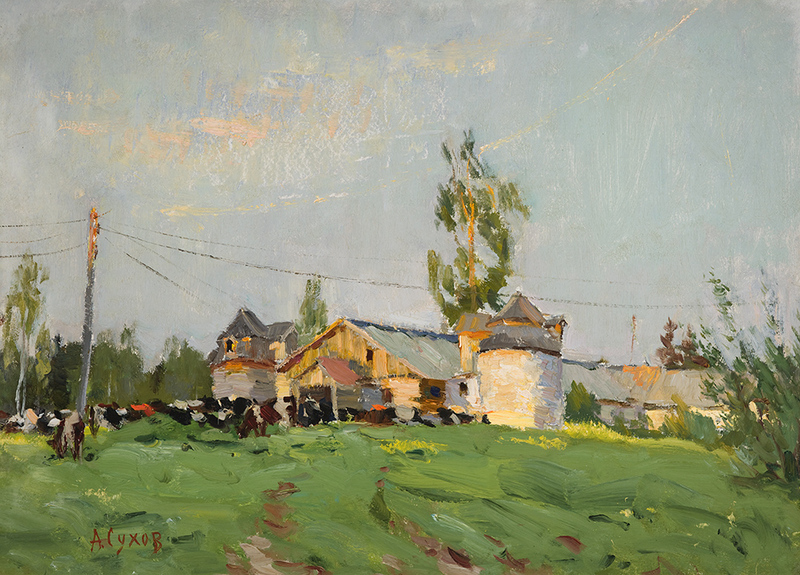 The final bid for "Collective Farm" by the renowned artist Alexander Pavlovich Sukhov was just $2,500. The estimated price for the painting was $4,500! Thank you to everyone who placed bids. As our April auction choice, we are pleased to present another great painting by the renowned artist Alexander Pavlovich Sukhov - one that is perfect for the coming season: "Spring Garden". This painting value is estimated at $5,200. Bidding begins at $250, followed by minimum bidding increments of $250. The auction will end at 6 PM on Saturday, April 30th. The owners of the McCarthey Gallery met with Alexander Pavlovich several times in his studio in the outskirts of Moscow. He was a humble and kind man who kept a large inventory of paintings at his studio. Over the course of his long career, weekdays for Sukhov were spent officially painting for the "State". However, his nights and week-ends were filled with painting that kept his soul happy. It was these personal paintings that filled his studio as during the Soviet time it was difficult, if not impossible, to sell art independent of the government. Over the years this allowed Alexander Pavovich over the years to build up a great inventory of passionate work. It is this weekend painting which nourished his artistic spirit and produced this month's auction piece "Spring Garden". He was born in the town of Kasimov (Ryazan Region) in 1921. He has been living and working in Moscow since 1939. He is a member of Moscow Union of Artists. He graduated from the Artistic College named after the Memory of the 9th of January in Moscow. Since 1953, he has been participating in the City, Republican, zonal and All-Union Art Exhibitions. In 1941-1945, he had been taking part in the Great Patriotic War. As for his creative activity, the artist continues the traditions of the Russian realistic school. He successfully combines artistic touches of the academician art with free natural painting. Sukhov A.P. paint in various genres, such as complicated multi-figure genre compositions, official and chamber portraits, urban and rural landscapes. For many years, the artist has been making his trips to gather material for his creative work. He visited different regions of Russia, such as Vladimir, Yaroslavl, Kostroma Regions, as well as Siberia and the Ural. The paintings of Sukhov A.P. are exhibited in local museums of Russia, as well as they are kept in a number of private art collections both in Russia and abroad. 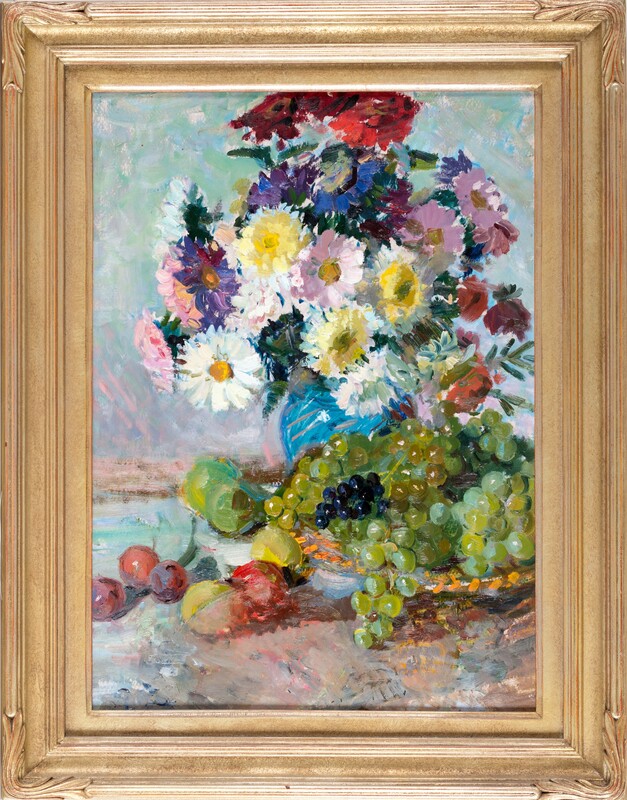 Congratulations to H. Milne who placed the the winning bid for April's auction and added a treasure of impressionistic painting to her collection and for a great price too. 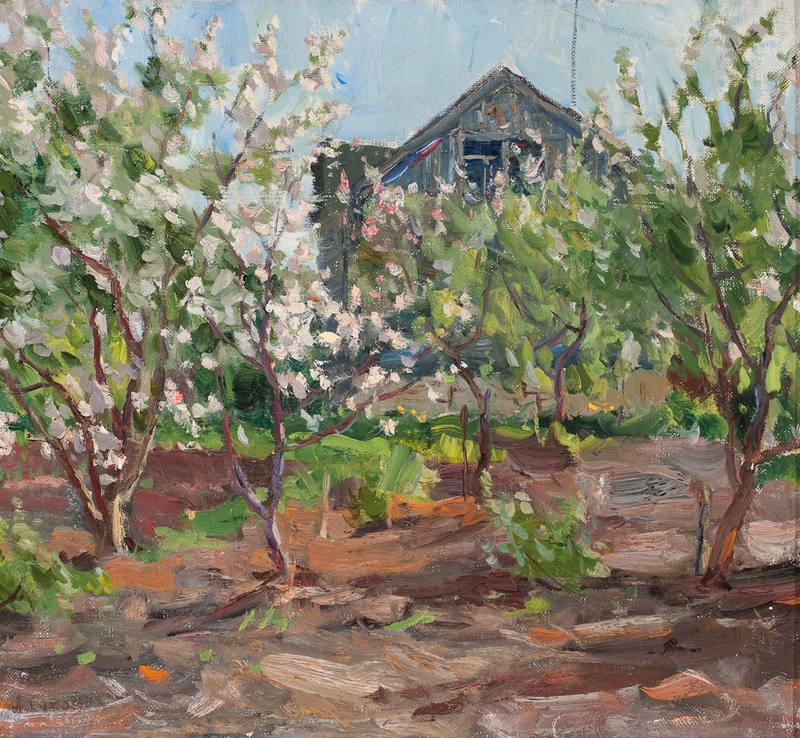 The final bid for "Spring Garden" by the renowned artist Alexander Pavlovich Sukhov was just $2,750. The estimated price for the painting was $5,200! Thank you to everyone who placed bids. As our May auction choice, we are pleased to present a great painting by a remarkable artist- Anatoli Sergeyevich Glinov, "House with Red Roof". This painting value is estimated at $3,500. Bidding begins at $250, followed by minimum bidding increments of $250. The auction will end at 5 PM on Tuesday, May 31st. Even if you do not normally read the artist bio's, make this month an exception! The story of Anatoli Sergeyevich Glinov is remarkable. He embodies everything great about the spirit of the Russian people. His wisdom, strength and unbounded artistic talent come optimistically through in his work despite the horror of his young life experience. In this landscape of the Russian countryside, Glinov paints the ordinary but after his grim war time, his soul never allowed him to take a beautiful, sunny, warm spring day for granted. His appreciation of life comes brimming through on the canvas. Glinov was born into the family of peasants in the village of Novopavlovka, Mezhervsky district, Dnepropetrovsk region in 1916. Thirst for knowledge led him to the Dnepropetrvsk arts secondary school which he finished in 1938 and after graduation he entered the Kiev Art Institute. The Great Patriotic war, however, interrupted his studies at the Institute and broke the artist's creative plans. His soldier's lot was a hard one. Anatoli Glinov had to pass through many terrible ordeals of the war. He was taken prisoner and sent to the "Shtalag-326" concentration camp, Shtuckenbrock. Everything he had to go through at the concentration camp formed the basis of his drawings executed in captivity and after the liberation. The drawings "On the Plank Bed," "In the Barrack," "A War-Prisoner's Day Ration" and others commemorate on canvas inhuman life conditions of the prisoners. These sketches were made use of for the popular science film "Flowers for Shtuckenbrock," produced by the "Tsentrnauchfilm" Studio, and for the book "Art Born in Battles" by M. Peckarsky. The sketches were exhibited at the museum for patriotic education of teenagers, organized at Moscow School No. 863. After the liberation, the former prisoners of the concentration camp -- the artist A.A. Mordany, a Moscow monumental designer subsequently; the painter A.S. Glinov; the engineer N.P. Smirnov and others -- became the authors of an obelisk-monument placed at the common grave of 65,000 prisoners of war perished there. On returning to his homeland, Anatoli graduated from the Institute and was directed to his Alma Mater school in Dnepropetrovsk to work there as a teacher. He started working at the Arts Fund simultaneously. Within a length of his creative life, Anatoli managed to combine teaching and painting. He contributed his pictures to numerous regional art exhibitions. His paintings of the post-war years are mainly dedicated to modern themes: "The evening party for youth" 1960, "The construction of the Dneprodshershinsky hydro-electric power station" (1961) and others. These pictures were followed by "Shevchenko in Yekaterinoslav," "Pushkin in Yekaterinoslav" (1964, 1965). The sketch to the picture about Pushkin proved to be particularly expressive with a peculiar romantic mood prevalent in it. Being a participant of the Great Patriotic War, Anatoli frequently came to meetings with people of younger generations - schoolchildren, students, cadets. At such gatherings, he told his young listeners about the war events. The meetings of that kind gave rise to such new works of paintings as "The ceremony of joining the prisoners" (1984), "The Nakhimov school graduates are taking the oath on board the cruiser 'Aurora'" (1985). The landscape still remains for the artists the most favorite genre of painting. 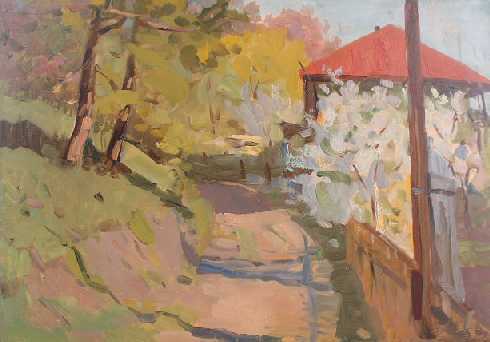 Nature's surroundings are exceptionally magnetic for the painter, no matter to what parts of his homeland they belong -- the Northern Ukrainian Chernigov land, or his native parts adjacent to the Dnieper River ("On the Samara River," 1983), or the South Crimea's shores ("Old Gurzuf," 1978), or Leningrad landscapes. Especially fruitful for his artistic career was a space of time spent by Anatoli at the House of Rest and Creativity in Sednyov where he rested and worked at the same time in 1969 and 1970. There he worked enthusiastically on sketches from nature, met the prominent Ukrainian masters of painting N.P. Glushchenko and T.N. Yablonskaya. All that evoked a rush of inspiration and creativity with Anatoli, which resulted in numerous landscape canvases. Such pictures are "The cottage where T.G. Shevchenko stayed," "Winter in Sednyov," "The Cossack church at Sednyov," and "Apple-trees in full bloom" are certain to be his best landscapes. This exposition of Anatoli's pictures sums up a forty-year period of his creative artistic activity. The best works show us sincere, deep feelings of the artists who never ceases studying his subject from nature, from life, from his colleagues. Anatoli is always generous to share his knowledge and experience with younger painters who are beginning their ways in arts. Anatoli S. Glinov devoted the best years of his creative life to the Dnepropetrovsk arts secondary school. It was there that he studied in the thirties and that he spent the best years of his pedagogical activities which brought him great satisfaction. Among the pupils of Anatoli, one can find L.I. Vitkovsky, Honored Art Worker of the Ukrainian Republic; N.S. Borovsky, the Ukraine's Honored Artist; the painters V.A. Zhugan, M. Ya. Kozyulin and others. This is a fun way to add a little excitement to your life while at the same time adding to your Russian art collection! Every month we select a painting and hold a no reserve silent auction. It pays to keep close attention to the Gallery's monthly auction. 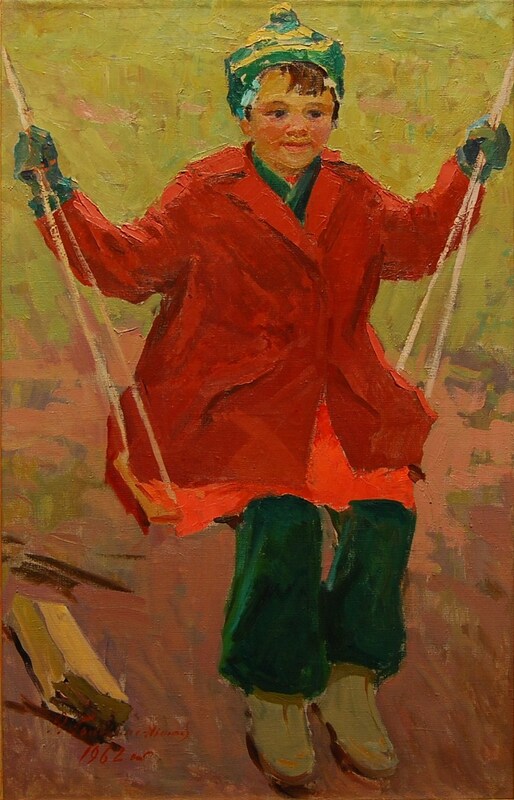 In February, our winning bidder got a great painting for a great price "Masha on the Swing" by Rufina (Raisa) Dmitrievna Golovina. The final high bid was just $3,500 and the estimated price for the painting was $6,500! Congratulations to P. Sullivan who placed the the winning bid for February's auction piece while watching a dog sled race in Alaska! Thank you to everyone who placed bids, we look forward to more excitement this month. The owners of the McCarthey Gallery met with Alexander Pavlovich several times in his studio in the outskirts of Moscow. He was a humble kind man who kept a large inventory of paintings at his studio. Over the course of his long career, weekdays for Sukhov were spent officially painting for the "State". However, his nights and week-ends were filled with painting that kept his soul happy. It was these personal paintings that filled his studio as during the Soviet time--it was difficult, if not impossible to sell art independent of the government. This allowed Alexander Pavovich over the years to build up a great inventory of passionate work. It is this weekend painting which nourished his artistic spirit, that this month's auction piece "Collective Farm" was produced. View an enlargement of "Collective Farm"
Rufina (Raisa) Dmitrievna Golovina"Masha on the Swing"
The painting "Masha on the Swing" is a genre portrait of the artist's daughter. While we were in the small city of Kostroma in 1990, visiting the famous Russian artist and professor Alexei Belykh, he brought us down the hallway to the studio of Rufina (Raisa) Dmitrievna. Professor Belykh told us that Raisa was a very talented artist who had dedicated her life to her art and to her family. She was not as well known as some of her contemporaries but professor Belykh felt that she had an "immense talent", and that we should meet her and have a look at her paintings.After several hours of talking and looking through Rufina Dmitrievna's art, we selected a few for purchase. One of the ones we like most was "Masha on the Swing". Raisa was hesitant to sell the portrait of her daughter but with a little persuasion we were able to obtain this magnificent painting which shows the universal image of a contented young girl enjoying a swing on a frosty early spring day. Rufina Dmitrievna Golovina was born in Kostroma in 1927. After graduating from the secondary school in 1944, she entered at Artistic School in Kostroma. Her teacher was an excellent pedagogue N.P.Shlein, the Honored Art Worker of the Russian Federation. He managed to create the atmosphere of creative enthusiasm. N.P.Shlein was a student of an outstanding artist Valentin Serov. N.P.Slein was not only an outstanding pedagogue, but also a great master of portraits and an excellent landscape painter. He had a subtle perception of the Russian nature. His Portrait of M.Gorki on the Capri Island is well known. In 1930-s N.P.Shlein moved over to Kostroma. He organized his school there. Later it was reorganized into the Artistic School. N.P.Shlein created the so-called Kostroma school of painting. It yielded neither Moscow nor Saint-Petersburg schools in its painting culture and preserved specific features of its own. R.D.Golovina was a typical representative of that school. In 1949 under the direction of N.P.Shlein, she painted her Diploma picture "Presentation of Komsomol Badge". That year she entered the Institute of Painting, Sculpture and Architecture named after I.E.Repin in Leningrad. She studied at the Faculty of Fine Art and graduated from it in 1957. From that time, R.D.Golovina successfully combined her work as an artist and a fine art expert. She had been working as a Director of Picture Gallery from 1957 to 1961 in Kostroma. After that, she was a senior teacher of the Artistic and Graphical Faculty at Pedagogical Institute in Kostroma. She was a permanent participant of art exhibitions - Group, Regional, Zonal and Republican. R.D.Golovina visited several times the House of Artists' Creative Work - the "Academician Summer Cottage". She improved her workmanship there under the direction of famous painters. She became a member of the USSR Union of Artists in 1963. There were personal exhibitions of R.D.Golovina-Anisimova in 1977 and 1988. Artist's creative range is wide enough. She painted genre everyday pictures, landscapes and portraits, still life and graphical drawings. There were two dominant themes, which could be distinctly traced in her paintings. The first one was devoted to everyday life and villagers' work. The second was devoted to village kiddies with their spontaneity, ingenuousness and frankness, as well as their naivety and youthful enthusiasm. The beauty of people's labor, her amorousness and devotion to the Russian land were vividly revealed in such paintings as "The Milkmaid", "At the Well", "The Collective Farm Yard", "The New Dress", etc. She watched attentively villagers' life and she often painting their portraits: "A.I.Bolshakova", "A.I.Mazaeva", "Z.A.Smirnova, the Master Builder" and others. While painting the portraits of her contemporaries, the artist sought after the genre, which could synthesize her conceptions and intentions. She achieved unity and interaction of a person and his/her surroundings. It contributed to the reproduction of her heroes' many-sided inner world. The artist also painted such lyrical landscapes as "The Willow", "The Lilac Evening", "The Apple-Trees in Blossom", "The Camomiles", "The Aspen Tree in the Sun", etc. Artist's freshness and frankness of perception were harmoniously combined with her subtle feeling of nature's beauty. R.D.Golovina devoted to still life much time. There was the same leitmotif, namely "the portrayal" of village labor, everyday life and household goods with which the peasants had lived and worked for centuries. In such paintings as "The Still Life with Cranberries", "The Warm Bread", "The Peasant Spinning Wheel", "The Golden Onions", etc., the artist did not only accustomed the spectators to the richest sources of people's culture, but she also paid tribute to peasants' blessed labor. There was quite a number of graphical works in R.D.Golovina's heritage. In this connection, the series of her watercolors and drawings devoted to Russia's literary places should be mentioned. They are "A.Kern's Alley in the Mihkailovskoye Village", "The Study of F.M.Dostoevsky in Staraya Russa", "The Museum - Country Estate of N.A.Ostrovsky in Shelykovo" and others. 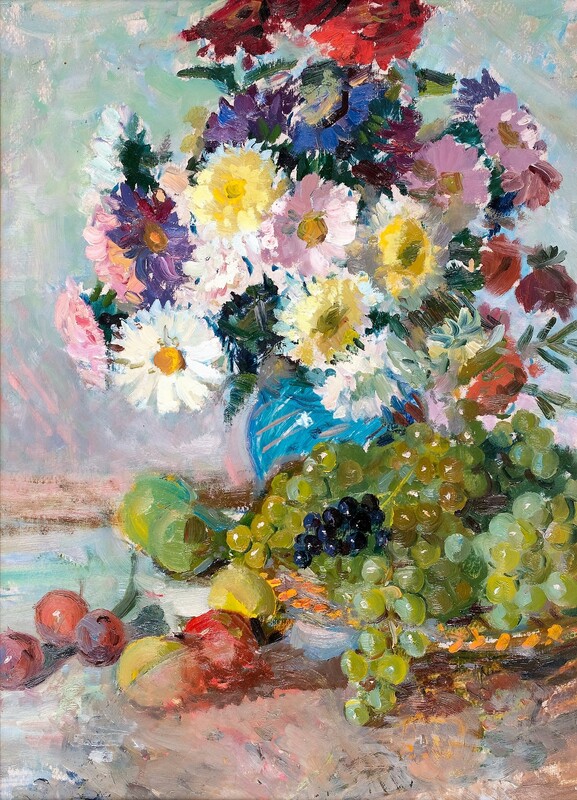 R.D.Golovina's pictures were painted in buoyant, exuberant and light coloring. They are sunny and full of air. The artist liked painting the Nature and she usually painted her heroes in nature's background. R.D.Golovina-Anisimova was a painter of vivid, original and distinctive artistic vision. In her creative work, she aimed at frank, simple and sincere perception of nature, as well as vital, optimistic and life-asserting portrayal of peasants' way of life.